Our portfolios deliver exceptional value and performance by focusing on true diversification, cost management, target-based rebalancing and tax management. Investing is complicated. We focus on efficiency by reducing the costs to our clients and delivering incremental, risk-adjusted return. The goal is more money in your pocket—even after our fees—and a portfolio that won’t deliver any unexpected surprises. We build low-cost, tax-efficient diversified portfolios of index or asset-class mutual funds and exchange traded funds. Our portfolios are tailored to the client’s individual financial goals and risk tolerance. Building properly diversified portfolios can be hard, but it is one proven way for investors to earn higher returns relative to risk. Indeed, the author of the basic concept of the “diversification effect” was awarded the Nobel Prize in economics. 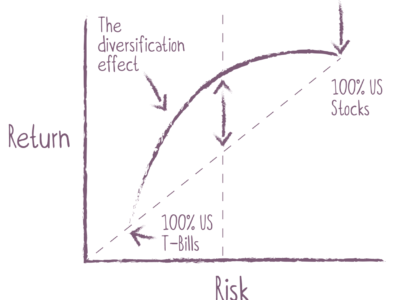 At Plum Street Advisors we build intelligently diversified portfolios. We want to gain the positive risk/return improvement from combining uncorrelated investments that tend to go up and down at different times and rates, but as we saw in 2008 during a crisis (when you need diversification most), previously uncorrelated assets have a tendency to start moving together. Therefore, we look at correlation in a variety of economic periods, not just an “average” correlation, to help your portfolio weather the elements. Are there other ways to earn higher returns? In fact, there are. Three other strategies have been shown in repeated academic studies to earn higher returns – cost management, systematic rebalancing, and tax management. More money in your pocket, even after you pay your fees. Controlling costs is the only certain way to impact investment performance because unlike market returns, we can know what costs are going to be in the future. Investing can be expensive, and most of the costs of investment are hidden from the typical investor. Indeed, the typical investor investing in a portfolio of mutual funds and exchange traded funds (ETF’s) is often paying 2.00% or more annually in overall investment costs and never knowing it (see Figure 1 below). These “overall costs” include management fees, sales fees, fund expenses, transaction costs, spread costs, and cash drag. Most of these costs are “internal” to the fund or the transaction which means you don’t receive a bill, they just “take it off the top” from what you would have earned otherwise. If you can reduce those costs by half, let’s say 1.00% annually, the odds are that you will make 1.00% per year more. It is not rocket science. It is common sense. Unfortunately, knowing where the fees are hidden, and how to reduce them, is not easy. 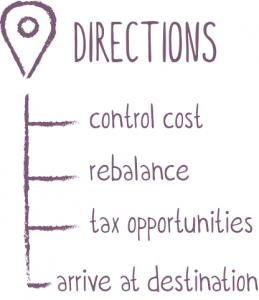 That is why cost reduction is a primary focus of Plum Street Advisors. Our goal is to keep both our advisory fees and the internal costs structure of our portfolios very low so that the total investment costs remain very competitive when compared to other advisors in the industry. Remove the guesswork with math and discipline. When we build you a portfolio we target portfolio allocations which are consistent with your desired long-term return and level of risk. This involves allocating different percentages of your portfolio to different types of investments; for example, a particular percentage to high quality bonds, another percentage to U.S. stocks, another percentage to foreign stocks, and so on. If we have done our job right, those percentage allocations represent the optimal allocations for achieving your financial goals. But over time, as some investments may increase or decrease in value, the mix of investment allocations in your portfolio will change. It is important to systematically rebalance the portfolio back to its optimal allocations at periodic intervals. Not only does this ensure that your portfolio will continue to reflect the best path to achieving your financial goals, but it also has been shown to actually increase the return of the portfolio relative to risk compared to portfolios which are not systematically rebalanced. It is a complicated process, which often involves other issues (such as the realization of unwanted capital gains), so it needs to be done carefully. Navigating the complex labyrinth of the tax code. When you realize a gain on the sale of an investment, or receive an interest or dividend payment, it is normally taxed, and the taxes you pay reduce your net after-tax return. However, in order to encourage certain economic activities, the government does not tax, or gives favorable tax treatment to certain types of investments or accounts, such as municipal bonds or many retirement savings accounts. This creates opportunities for increasing your net after-tax return by taking advantage of these favorable tax treatments. The tax code is a labyrinth of complex and often confusing regulations, so once again, it is not an easy process to effectively optimize the tax efficiency of investment accounts. It often involves the deferral of capital gains, the harvesting of tax losses, the use of tax-exempt or tax-deferred investments, the allocation of different types of investments to different types of accounts to maximize the tax advantages, and so on. At Plum Street Advisors, we will guide you through this complexity, because doing so will likely increase your after-tax return. Are there investment strategies that don’t increase returns? Yes, and unfortunately they are strategies often pursued by inexperienced investors. The two primary ones are stock picking and short-term market timing. Their allure is their simple logic: the most successful investor must be someone who can pick which stocks will go up the most, or can foresee the short-term swings in the market. But large liquid markets of publicly traded securities, like the U.S. stock and bond markets, don’t work that way. They price securities very accurately at or close to their intrinsic values. That means attempts to stock pick or short-term time the market are futile, and studies have shown time and again that these strategies don’t work. In fact, these strategies usually decrease returns because they increase costs. There is no easy road to investment success. It involves time and hard work. You only will be successful as an investor if you have a clear plan of where you are going and how you are going to get there. You only will be successful if you do the hard work of building an efficient diversified portfolio; if you continually work to understand and control costs; if you systematically rebalance your portfolio to its optimal ratios; and if you take advantage of favorable tax opportunities. It requires time, knowledge, discipline, perseverance and patience. There is no magic answer. But if you stick to it, you can reach your financial goals. We are here to help.